Bob Zurek, the Chief Technology Officer at EnterpriseDB interviewed me a few months ago for their new Database Radio podcast. It finally was published last week. Bob and I had a nice conversation about PostgreSQL and it’s community, our use of PostgreSQL with Ruby, Ruby on Rails, and development tools/methods. You can listen to the podcast mp3 and/or read the transcript. 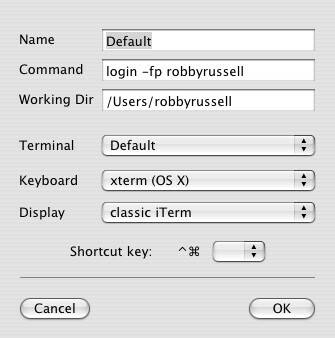 Over the past few years, I’ve helped you walk through the process of getting Ruby on Rails up and running on Mac OS X. The last version has been getting a lot of comments related to issues with the new Apple Leopard, so I’m going this post will expand on previous installation guides with what’s working for me as of January 2008. WARNING: This post contains some outdated instructions. Please read Installing Ruby on Rails, Passenger, PostgreSQL, MySQL, Oh My Zsh on Snow Leopard, Fourth Edition , which is focused on Installing Ruby on Rails on Snow Leopard. During this installation, we’ll have what we feel is the optimal development stack for building Ruby on Rails applications with our favorite database server, PostgreSQL. During this initial phase, we’re going to install the underlying dependencies that we’ll be building off of. The first thing that you’ll need to install to get far with this process is XCode tools, which is distributed by Apple. You can find this on the DVD that your Leopard installer is on. You can also download the latest version from Apple’s developer site. This tool is about to become one of the most important tools on your operating system as it’ll be used time and time again to maintain your libraries and many of the Unix tools that you’ll be using. If you’re from the Linux or BSD world, you are likely familiar with similar tools… such as: apt-get, port, and yum. First, you’ll want to download MacPorts and install the “dmg” disk file for Leopard at the following link. Once downloaded, you’ll want to run the installer and install it on your workstation. Work you way through the installer until successfully installed. Once this finishes, you can open up your favorite terminal application and run the following to test that it installed properly. In my case, I’m now using Terminal.app. If it responds with a version number like mine did in the screenshot above, we’re moving along nicely. 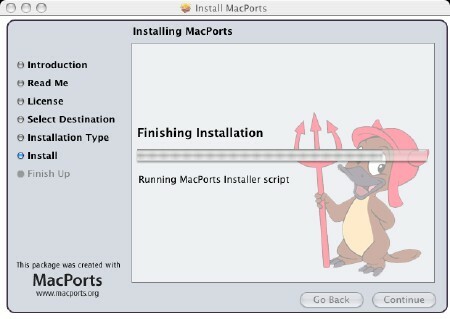 When we install MacPorts, the command to install/update ports installed to /opt/local/bin. We had to provide the entire path as this isn’t currently showing up in the default $PATH on Leopard. Let’s quickly remedy this by modifying the file /etc/profile. Add the following line to the bottom of /etc/profile. You can use your favorite editor to update this file. Once you save it, you’ll want to restart your terminal application (or open a new tab) to create a new session. When your new terminal opens, run the following to verify that port is showing up in your $PATH. You should see /opt/local/bin/port show up as the result of this command. Great, let’s continue to move forward. Before we install Ruby from MacPorts, we’ll go ahead and hide Apple’s Ruby installations. If you ever decide to remove MacPorts, you can just rename ruby.orig back to ruby and you’re back where you started… and the same for the others listed. During this next phase, we’re going to install Ruby and Ruby on Rails. Now that we have MacPorts up and running, we’re going to use it for the first time. We’ll start by using it to install Ruby and the Rubygems package. Okay, this will take a little while. I’d suggest that you step out to get some fresh air. How was it outside? What’s the weather like there today? It’s currently 2:30am PST so it’s dark and an 28F outside so I didn’t stay outside very long. If you’re still waiting for it to install, perhaps you could watch the following video. I might encourage you to check out more of Jam, which was recommended a few years ago to me by James Adam at Canada on Rails. Okay… when Ruby finishes installing, you’ll want to test that you can run it. We’re now going to install the libraries that make up Ruby on Rails via RubyGems. This will install the following gems. If you haven’t already purchased it, I recommend that you take a look at The Rails Way (Addison-Wesley Professional Ruby Series) by Obie Fernandez. Let’s now install Mongrel, which is an excellent Ruby-based web server for Ruby on Rails applications. We use it in development and production at Planet Argon and it’s also what we recommend to our hosting customers. Great, you have almost all of the essentials.. except a database. In this phase, we’re going to get our database server, PostgreSQL, installed and the libraries that Ruby needs to communicate with it. At Planet Argon, we design and develop our applications on top of PostgreSQL. I’ve been advocating the adoption of this awesome open source database in the Rails community for quite some time now. The current version available of PostgreSQL via MacPorts is 8.3, which is what we’ll now install with the port command. This will download and install the necessary libraries to run PostgreSQL server and the client utilities. When PostgreSQL is finished installing, it’ll tell you to run the following commands to create a new database instance. If you’d like to have PostgreSQL automatically startup after a system restart, you can load it into launchd, which comes with OS X. By running the following command, PostgreSQL will startup automatically on the next system restart. For some reason, the MacPort for PostgreSQL doesn’t get the programs in your path automatically, so we’ll it now. Modify the PATH that we changed earlier to include /opt/local/lib/postgresql83/bin@. Save the file and then open a new terminal. To test this, you should get the following output when you run which psql. When I’m working on Rails applications in my development environment, I really don’t want to have to specify a username and password in every config/database.yml file for each of our ongoing client projects. When PostgreSQL was installed, it created a superuser named postgres, which is great, but I’d like one that matches my system username, so that I’m not prompted at all for a username or password to connect to PostgreSQL. To do this, we’ll use the createuser command, which comes with PostgreSQL. As you can see, I’m creating a new user with superuser privileges (and will hopefully be the last time I have to do a -U postgres). Let’s take a quick moment to test this out. Great, everything looks good here. We now have a running installation of PostgreSQL with a new user account. All we need to do now is install the appropriate RubyGem to allow our Ruby applications to connect to it. You can install postgres gem by running the following command. Like the previous versions, I hope that a few people find this useful. I didn’t have to make a lot of changes from the second edition, but there were enough to warrant a new post. I’ve been setting up my workstation like this for about three years now and I’m looking forward to seeing how a fresh install on Leopard works out for me. If you have any problems, feel free to ask a question in the comments below. Are you using PostgreSQL (the world’s most awesome open-source database server) with Ruby on Rails? Do you have any interesting experiences that you might want to share with an audience? Well, you might consider submitting a talk proposal for PGCon 2008, which is taking place in Ottawa, Canada. PGCon 2008 will be held 22-23 May 2008, in Ottawa at the University of Ottawa. It will be preceded by two days of tutorials on 20-21 May 2008. We are now requesting proposals for presentations. It’s been just over a year since I posted the article, Install Ruby, Rails, and PostgreSQL on OSX and it still gets quite a bit of traffic. Unfortunately, there have been a few changes in the install process that have caught people. Today, I am leaving my PowerBook G4. It’s being replaced with a MacBook because the logic board is on the fritz. So, guess what that means? I get to install Ruby, Ruby on Rails, PostgreSQL on OS X again! I figured that I would post a revised version of my previous article for those who may go through this same process in the near future. WARNING: This post contains some outdated instructions. Please read Installing Ruby on Rails and PostgreSQL on OS X, Third Edition, which is focused on Installing Ruby on Rails on Leopard. You’ll spend a lot of time in your terminal as a Rails developer. I’m not a big fan of Terminal.app as it lacks tabbed windows1 and you’ll often find me with around ten tabs open. I’ve been using iTerm for a few years and it’s definitely improved in the past year and doesn’t seem to crash nearly as often as it used to. Once installed, I always change the default color scheme as I prefer the white on black schema. The menus in iTerm are lacking some thoughtful interaction design, but I’ve figured out the right way to do it (after a long time of stumbling on it by accident). In iTerm, you’ll want to edit the Default bookmark, which you can access by going to Manage Bookmarks under the Bookmarks Menu. Set the Display value to classic iTerm and you’re golden. Without installing Xcode tools from Apple, we’re not going to get very far. First, you’ll need to grab a copy of Xcode, which you can download on Apple’s Developer Connection site. It’s almost a 1GB download, so you’ll want to start your download and use your multi-tasking skills and grab a Viso, read some blog posts. I’m going to make the assumption here that you know how to install a dmg on osx. Once this is installed, you can move on to the next step! MacPorts (formerly known as DarwinPorts) is a package management system for OS X. This is what we’ll use to install most of the necessary programs to develop and run your Ruby on Rails applications. If you’re from the Linux or BSD world, you are likely familiar with similar tools… such as: apt-get, port, and yum. You’ll want to download MacPorts and install the dmg file. Now that this is installed, we should test it. We’re going to go through a series of small steps, which may take some time depending on how fast your internet connection and computer is. In order to install Ruby, we’re going to use MacPorts with the port command, which is now available for installing various packages on our OS X machines. It’ll probably take a while to download and install Ruby and all of it’s known dependencies. In the meantime, check out some funny code. KTHXBYE! Okay… I trust that it finished installing Ruby and RubyGems without any hiccups. Let’s test them from our terminal to make sure. Great, we’re on a roll. Let’s get the rest of the stack installed. We’re going to install Ruby on Rails with the gem command that installing RubyGems provided. This command should produce an output similar to the following. If you’re developing with Rails, it’s highly recommended that you use install and use Mongrel for your development and production environments. The following command will install the mongrel and mongrel_cluster gems (including their dependencies). Step 4: Installing the World’s Most Advanced Database Server… PostgreSQL! At PLANET ARGON, we develop our applications on top of PostgreSQL. I’ve long been advocating the adoption of this awesome open source database in the Rails community. Just over a year ago, Jeremy Voorhis (PLANET ARGON alumnus) and I were interviewed on the Ruby on Rails podcast and had the opportunity to discuss our preference of PostgreSQL over the alternatives (mysql, sqlite, firebird, etc.). We’re going to install PostgreSQL 8.2 from MacPorts by running the following command. While this is installing, you might take a moment to check out some space shuttles. Unless you’re concerned about extra applications running in the background, I’d encourage you to add PostgreSQL to launchd, which will start it automatically after system reboots. For some reason, MacPorts doesn’t add the PostgreSQL programs to the default bash PATH, which means that you can’t run psql, pg_dump, or createdb/dropdb without specifying the full path to where they were installed. What we’ll do is add them to our default terminal profile. This file gets loaded every time a new terminal session is started. Let’s add /opt/local/lib/postgresql82/bin to the end of the value for PATH. UPDATE: Hydro posted a commented, which lead me to the ruby-postgres gem. You can install ruby-postgres gem by running the following command. Let’s take a moment to test that this installed properly. If this returns true, than we should be good to go. We’ve now built a professional development environment for working with Ruby on Rails. Doesn’t that feel great? You can look back at my older post to walk through the process of testing out your setup with a new Rails application. I hope that this post has been useful for you. It took me a few hours to walk through this process and it’s how all of our designers and developers at PLANET ARGON installs and configures their development environment. We also install the following programs on new machines. Until next time… have fun!